ConsignPro can print a wide variety of tags and labels (stickers) on either your existing full-page printer, or, on our Zebra thermal tag printer. Below you will see examples of the different types, sizes, and styles of inventory tags and labels that you can use with ConsignPro. Avery 4” by 1” label with barcode. Avery products 5161 or 8161 are available from any office supply store. 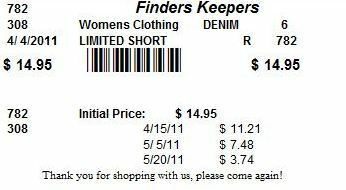 Avery 4” by 1” label with markdowns. Avery products 5161 or 8161 are available from any office supply store. Avery 2 5/8” by 1” label with barcode. Avery products 5160 or 8160 are available from any office supply store. The “ConsignPro tag sheets” are tickets for your inkjet or laser jet printer. Available from Forms Plus in a variety of colors. 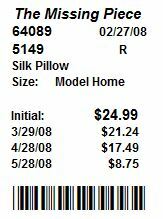 These tags sheets can be setup for either barcodes or markdowns. Order online. We can only guarantee compatibility with thermal tags or labels purchased from Forms Plus. These are the tags and labels that we have tested with our software and the only ones that we currently support. Use the Order Online links below or contact them by phone at (800) 241-2319. Zebra thermal 1” by 3 3/8” tags with barcode. These tags are product code “LBTH” from Forms Plus and available in a variety of colors. Also available in a label (sticker) format as “LBTHLBL”. Order online. 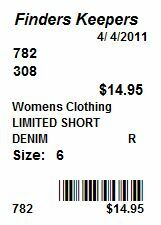 Zebra thermal 1” by 3 3/8” tags with markdowns. These tags are product code “LBTH” from Forms Plus and available in a variety of colors. Also available in a label (sticker) format as “LBTHLBL”. Order online. Zebra thermal 2” by 3 3/8” tags with both barcode and 3 markdowns. These tags are product code “LBTH” from Forms Plus and available in a variety of colors. Also available in a label (sticker) format as “LBTHLBL”. Order online. Zebra thermal 1” by 3 3/8” tags with both barcode and 2 markdowns. These tags are product code “LBTH” from Forms Plus and available in a variety of colors. Also available in a label (sticker) format as “LBTHLBL”. Order online. Zebra thermal 2.25” by 1.25” thermal labels (stickers) are available from Forms Plus. Order product code “LBTH- 1”. Order online. Zebra 2 3/8” by 1 1/2” “one-up” thermal tags with barcode are available from Forms Plus. Order online. Zebra butterfly-style thermal jewelry labels are available from Forms Plus. Labels are 2.20” by 1/2” and “wrap around” your rings and bracelets. Product code JEWLR. Order online. Zebra 1” by 1” thermal label “squares” are available from Forms Plus. These stickers are perfect for smaller items. Product code JEWLS. Order online.